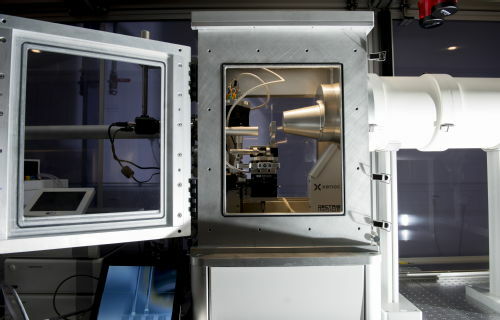 Small Angle X-ray Scattering (SAXS) is a powerful X-ray technique which allows the non-destructive investigation of nanoscale particle size, distribution and morphology. Typical applications include polymers (liquid dispersed, solid or powders), nanocomposites, magnetic nanoparticles, oils and coatings with nanocrystalline regions. At Warwick, a 5m Xenocs Xeuss 2.0 SAXS instrument is installed, equipped with dual microfocus (Cu/Mo) sources and a Pilatus 300K hybrid photon counting detector. The entire beam path can be evacuated, although the sample chamber can also be placed under air. A variety of samples stages are available for studying solids, powders, fibres, pastes, gels, liquid dispersed particles and thin-films or coatings (Grazing-Incidence SAXS). Other stages enable non-ambient experiments such as heating and cooling, as well as tensile strain measurements. Data collection times range from minutes to several hours depending on the type of sample and data required. To book time on the instrument, please contact Steve Huband, who will be able to assist you in undertaking the measurements and analysing the collected data.